Preheat oven to 375 degrees. Grease a 18 x 13 inch sheet pan. In a large mixing bowl, stir together sugar, flour, baking soda, salt, espresso powder, and cinnamon. In a separate bowl, whisk together eggs, buttermilk, and vanilla. In a small to medium sauce pan, melt the butter on medium-low heat. Whisk in the cocoa powder and coffee; increase heat to medium-high and bring the mixture to a boil. Add the melted butter mixture to the dry ingredients and mix thoroughly. Follow with the egg mixture and stir until all the ingredients are completely combined. Pour the batter into the prepared pan and rap on the counter a few times to distribute evenly. Bake the cake for 18 minutes. Remove from the oven and frost immediately. When the cake has 5 minutes left in the oven, start the frosting. In a medium to large saucepan, melt the butter over medium-low heat. Whisk in the cocoa powder until combined. Add the buttermilk, vanilla, and powdered sugar. Stir until all of the ingredients are completely incorporated. 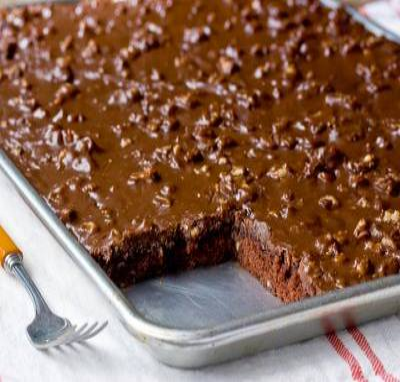 Fold the toasted nuts into the frosting and immediately pour over the warm cake. Use an offset to help gently spread a thin layer over the entire surface. Cool frosted cake on a wire rack for 1 hour, then moved to the refrigerator, preferably overnight. Serve cold or at room temperature.